Notice: Bulletin #13 has been adjusted to final bulletin status. FENGSHEN weakened into an area of low pressure this (26/6) morning. FENGSHEN remained nearly stationary near Dongguan in the past 6 hours. At 20 HKT, FENGSHEN was centred about 120 km (60 NM) NNW of Hong Kong. The Observatory has cancelled all tropical cyclone warning signals at 22:15 HKT. FENGSHEN will move NNE at the northwestern periphery of the steering ridge. FENGSHEN will dissipate inland near t+24. Heavy rains and winds associated with FENGSHEN will gradually subside in the next 24 hours. This is the final bulletin on FENGSHEN. FENGSHEN was closest to the Observatory at 04 HKT today (E 15 km), making landfall at Shenzhen. At 11 HKT, FENGSHEN was centred about 90 km (50 NM) N of the Hong Kong Observatory. The Observatory issued the No. 8 NE Gale or Storm Signal at 22:45 HKT last night, and was replaced by the No. 8 NW Signal and SW Signal at 00:45 and 05:45 HKT today respectively. Due to FENGSHEN's decreasing threat, the Observatory has issued the Strong Wind Signal No. 3 at 11:15 HKT. FENGSHEN will move NNW then turn NNE at the northwestern periphery of the steering ridge. The enhanced SW monsoon will bring rain to Hong Kong today and tomorrow. Occasional storm force gust in some areas is expected until tonight. FENGSHEN moved steadily NNW in the past 6 hours towards Hong Kong. At 02 HKT, FENGSHEN was centred about 50 km (25 NM) SE of the Hong Kong Observatory. The Observatory issued the No. 8 NE Gale or Storm Signal at 22:45 HKT on 2008/06/24, and was replaced by the No. 8 NW Signal at 00:45 HKT 2008/06/25. A slight northwestern extension of the ridge to the southeast of the storm is visible in steering charts, and that extension has moved westward to about 25N 113E. Therefore, it is expected that FENGSHEN will move NNW towards area in the vicinity of Hong Kong and will then track NNE after making landfall along the NW periphery of the ridge. It is expected that FENGSHEN will be able to maintain strength before landfall at t+6, after which it will weaken as it encounters land. It will dissipate inland near t+48. 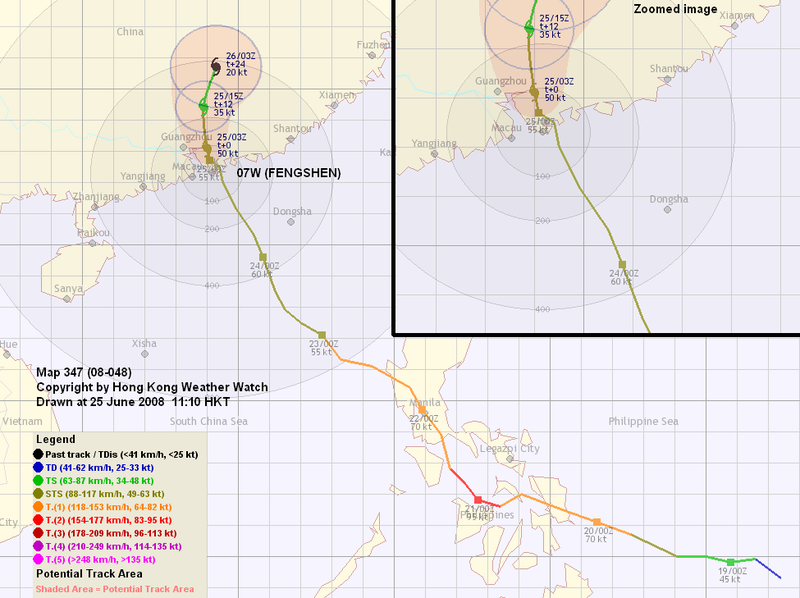 In the current forecast, FENGSHEN will make landfall at Hong Kong (closest point of approach is projected to be about 20 to 30 km ENE of the Observatory). As FENGSHEN's strnog winds associated with the rainbands are constrained to the southern quadrant and the system is small, winds will pick up rapidly tonight. NW winds are expected to reach gale force or above, turning counterclockwise to SW gradually. Heavy rain is about to start. Please perform all necessary precautionary measures and refer to official positions and forecast tracks to obtain the latest information. New advisories are issued as necessary after the No. 8 Gale or Storm Signal is issued. Please stay tuned for latest updates. FENGSHEN moved steadily NNW in the past 12 hours towards central Guangdong. At 20 HKT, FENGSHEN was centred about 140 km (80 NM) SSE of Hong Kong. The Observatory issued the No. 8 NE Gale or Storm Signal at 22:45 HKT on 2008/06/24, and was replaced by the No. 8 NW Signal at 00:45 HKT 2008/06/25. A slight northwestern extension of the ridge to the southeast of the storm is visible in steering charts, and that extension has moved westward to about 25N 114E. Therefore, it is expected that FENGSHEN will move NNW towards area in the vicinity of Hong Kong and will then track NNE after making landfall along the NW periphery of the ridge. It is expected that FENGSHEN will be able to maintain strength before landfall at t+12, after which it will weaken as it encounters land. It will dissipate inland near t+48. 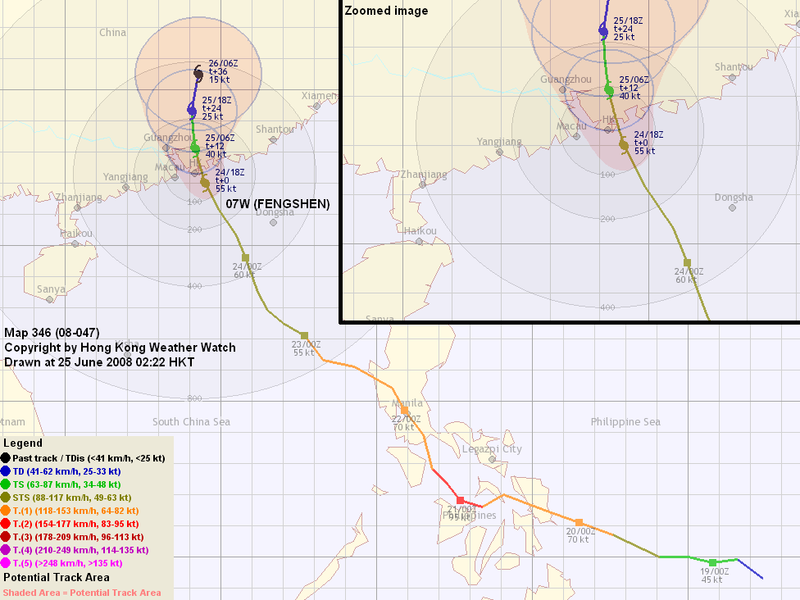 In the current forecast, FENGSHEN will make landfall at Hong Kong (closest point of approach is projected to be about 10 to 20 km E of the Observatory). As FENGSHEN's strnog winds associated with the rainbands are constrained to the southern quadrant and the system is small, winds will pick up rapidly tonight. NE winds are expected to reach gale force or above, turning counterclockwise to SW gradually. Rain is expected starting from tonight. Please perform all necessary precautionary measures and refer to official positions and forecast tracks to obtain the latest information. FENGSHEN moved steadily NNW in the past 12 hours towards Guangdong. As the system is small, Hong Kong's weather has not yet worsened even though FENGSHEN is already quite close to Hong Kong. 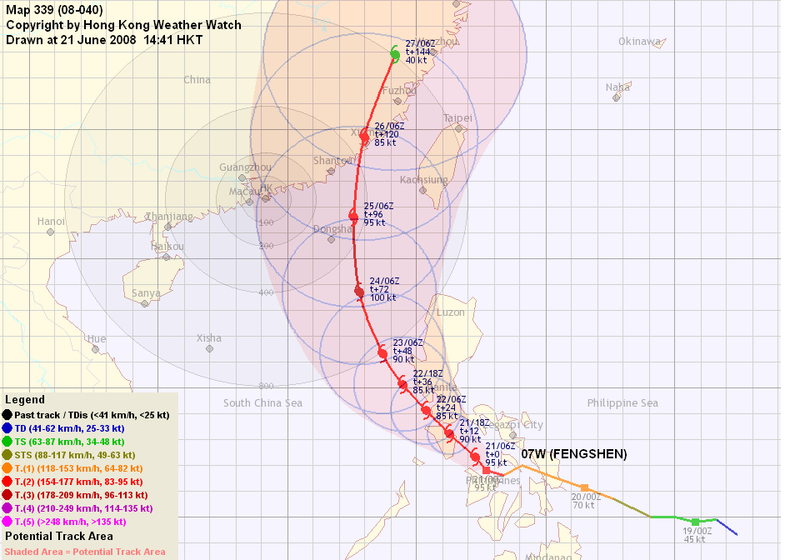 At 08 HKT, FENGSHEN was centred about 340 km (190 NM) SSE of Hong Kong. A slight northwestern extension of the ridge to the southeast of the storm is visible in steering charts, and that extension has moved westward to about 24N 115E. 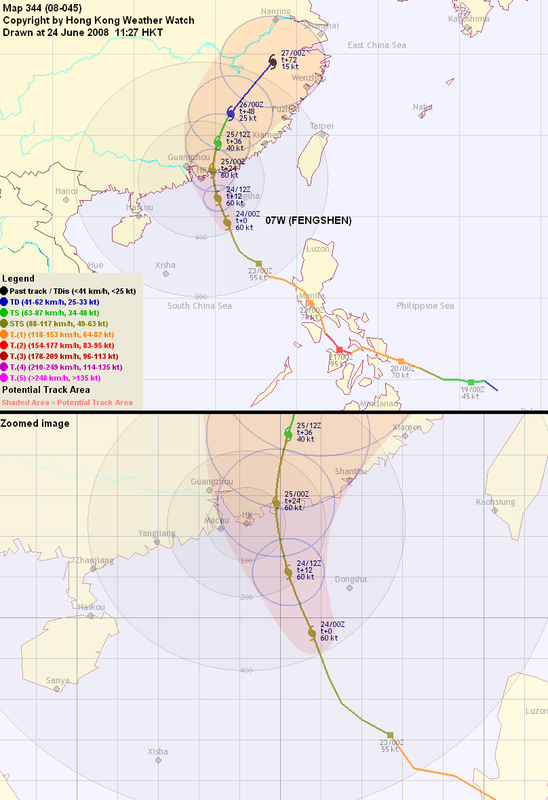 Therefore, it is now expected that FENGSHEN will move NNW before landfall and will then track NE afterwards along the NW periphery of the ridge. Although FENGSHEN has consolidated as it shrinks, the strong shear that FENGSHEN encounters is inhibiting its strengthening despite it is situated in warm sea surfaces with plenty of moisture from SW monsoon. It is expected that FENGSHEN will be able to maintain strength before landfall due to the combined effect of these factors, after which it will weaken as it encounters land. It will dissipate inland near t+72. 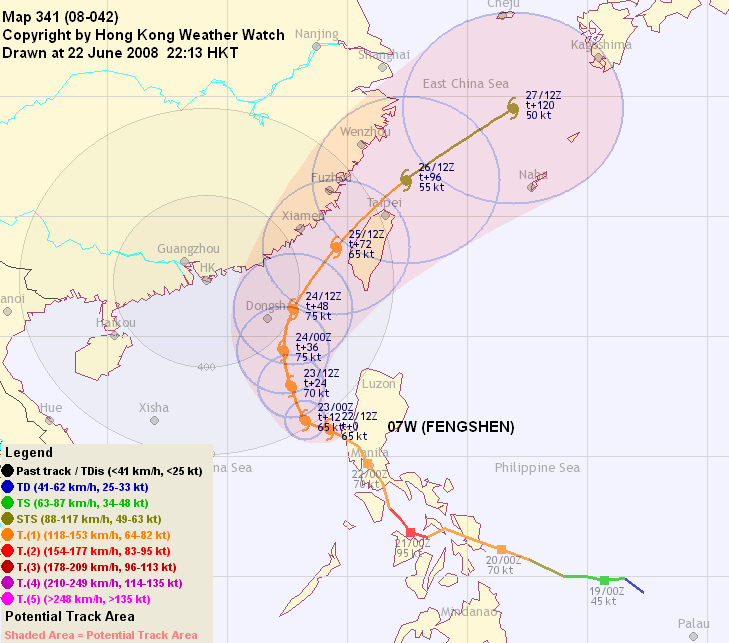 In the current forecast, FENGSHEN will make landfall within 100 km of Hong Kong. Winds will strengthen from the east then north near t+12 as FENGSHEN is approaching. Onset of rain is expected later today. The Observatory will consider the Strong Wind Signal in the evening. 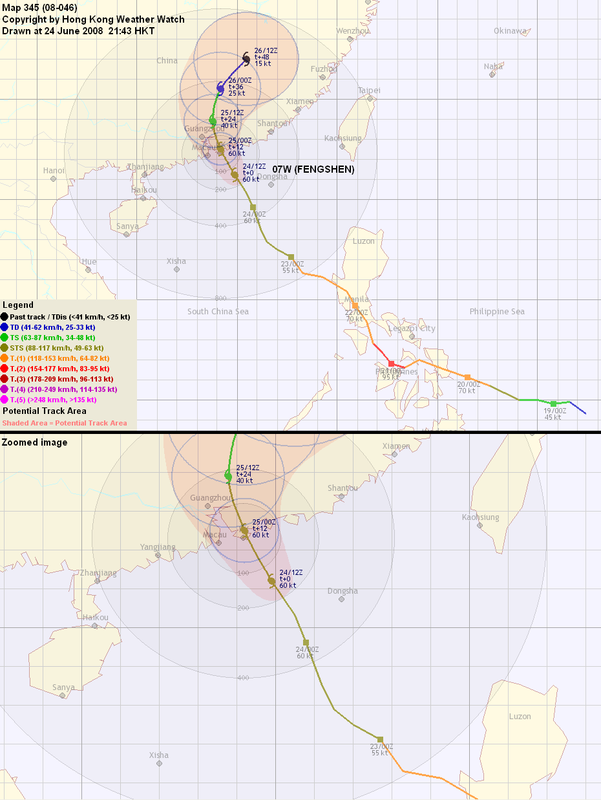 Please refer to official positions and forecast tracks to obtain the latest information. FENGSHEN moved NW in the past 12 hours, and HKO has downgraded it into a severe tropical storm (the last major official agencies to do so). At 20 HKT, FENGSHEN was centred about 550 km (290 NM) SSE of Hong Kong. The Observatory has issued the Standby Signal at 07:40 HKT today. FENGSHEN is in a weak steering environment currently, and from steering charts the ridge N of it has not yet disappeared completely (slight western extension can be seen near 23N 118E). The wind shear is still tearing newly-formed convections to the WSW of the storm, and its internal force (due to Coriolis effect) is deemed a major contribution to its NW track. Under this weak steering force it is expected that FENGSHEN will move NW to NNW in the next 24 hours, after which the extending equatorial anticyclone should be able to provide enough steering to allow a recurvature. The strong shear that FENGSHEN encounters is inhibiting its strengthening despite it is situated in warm sea surfaces with plenty of moisture from SW monsoon. It is expected that FENGSHEN will be able to maintain strength before landfall due to the combined effect of these factors, after which it will weaken as it encounters land. It will begin extratropical transition near t+72. Winds will strengthen from the northeast near t+24 to t+36 as FENGSHEN is approaching. Onset of rain is expected on Tuesday evening to Wednesday morning. Note that these depend greatly on FENGSHEN's point of recurvature, which is far from certain at this moment. Slight changes in the position of this point may result in completely different scenarios. Please refer to official positions and forecasts often to receive latest information. FENGSHEN further lost longitude in the past 12 hours, and has been downgraded into a severe tropical storm. 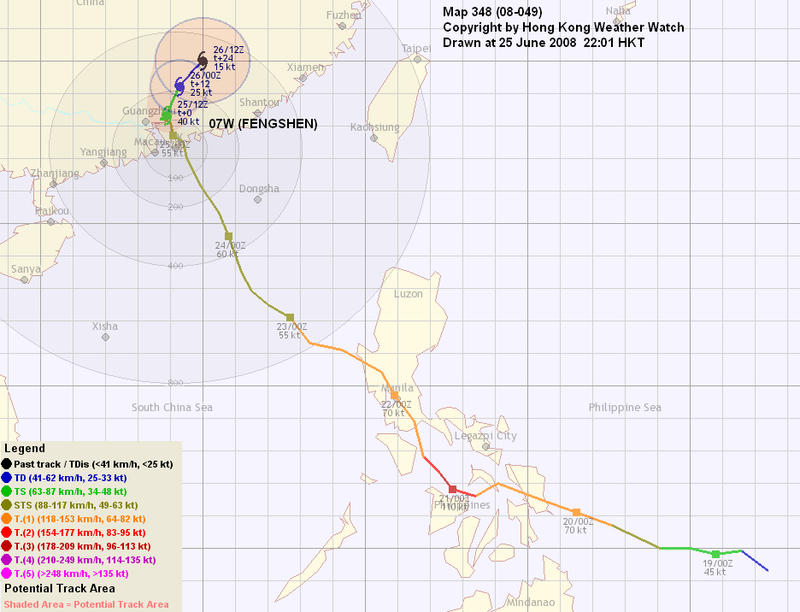 At 08 HKT, FENGSHEN was centred about 690 km (370 NM) SSE of Hong Kong. The Observatory has issued the Standby Signal at 07:40 HKT today. FENGSHEN's convection continues to be sheared to the west, while the storm's LLCC is moving WNW to NW in the past 12 hours. It is forecast that it will travel NNW under the influence of the ridge east of it, and will turn poleward then NE near t+36 towards Fujian as it moves along the northwestern periphery of the ridge. The strong shear that FENGSHEN encounters is contributing to its weakening. Slight intensification is still possible as it moves through the warm South China Sea but this factor will be quickly outweighed by lower sea surface temperatures and land interactions with Fujian by t+48. Subsidence air associated with FENGSHEN will bring very hot weather and light winds to Hong Kong today. Winds will strengthen from the northeast near t+36 as FENGSHEN is approaching. Onset of rain is expected on Tuesday evening. As FENGSHEN was crossing Luzon, convections formed to the west of the system and has led to a western relocation at 20 HKT. At 20 HKT, FENGSHEN was centred about 880 km (470 NM) SE of Hong Kong. Convections were seen to be forming near 117-119E since 16 HKT today and multiple potential centres have formed. It is therefore quite uncertain in the fix for 20 HKT (this bulletin), especially in its latitude. It is expected that the storm may move further west in the next 12 hours as the new centre is forming, and that the latitude will not increase by as much as in a NNW movement because most of the convections form below 16N, and the formation of a new centre may occur below that latitude. On the other hand, it can be seen from steering charts that the ridge N of FENGSHEN has collapsed at the 400-850 hPa layer, and that the storm should be tracked NNW/N after it consolidates. FENGSHEN will recurve near t+48 towards Taiwan as it moves along the northwestern periphery of the steering ridge currently to the east of it. FENGSHEN has moved offshore and slight intensification is expected through t+48 (great intensification is not expected as the vertical wind shear in South China Sea is forecast to be high), after which lower sea surface temperatures and land interactions with Fujian and/or Taiwan will cause it to weaken after t+60. It is expected that the subsidence air associated with FENGSHEN will bring very hot weather and light winds to Hong Kong in the next two days. Winds might strengthen from the northeast if FENGSHEN manages to edge even closer (less than 400 kilometres). FENGSHEN travelled NNW in the past 24 hours and has weakened into a category 1 typhoon. At 14 HKT, FENGSHEN was centred about 100 km (60 NM) NW of Manila. As the ridge N of FENGSHEN continues to weaken and the equatorial anticyclone E of the storm intensifies, it will travel NNW/N then NNE as the influence of the ridge to the north breaks down completely after t+36 to t+48. FENGSHEN interacted with the landmass of Luzon and thus has weakened in the past 24 hours. As the vertical wind shear in South China Sea has increased considerably last night (to above 30 knots), great intensification is not expected as FENGSHEN moves back to the ocean. Land interactions with Fujian and/or Taiwan will again hamper its intensification near t+60. It is expected that the subsidence air associated with FENGSHEN will bring very hot weather and light winds to Hong Kong in the next two days. FENGSHEN travelled due west last night, but started a northwesterly track a few hours ago. 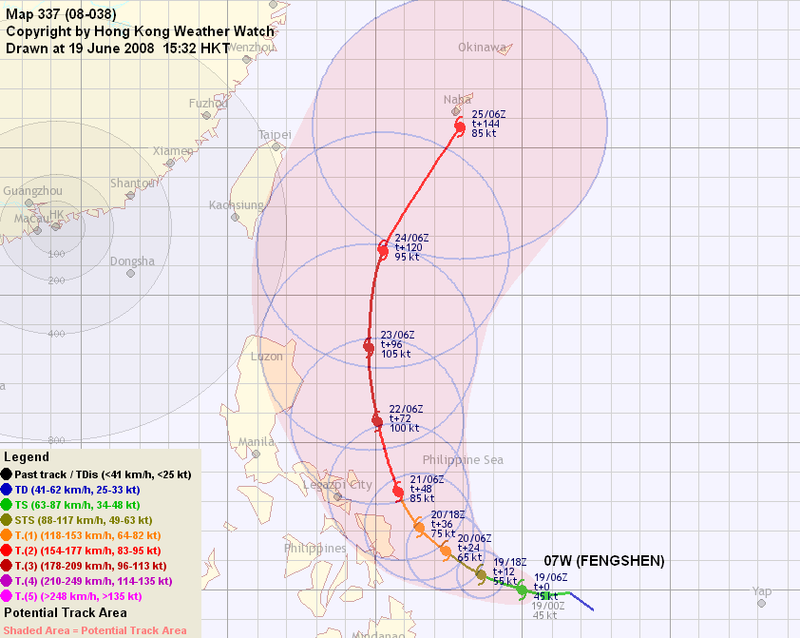 At 14 HKT, FENGSHEN was centred about 300 km (160 NM) SSE of Manila. The ridge N of FENGSHEN has weakened appreciably in the past 24 hours. As it continues to weaken, FENGSHEN will gradually be steered dominantly by the equatorial anticyclone east of it and move N. The current forecast calls for a recurvature less acute than that of the previous bulletin. The southwesterly airstream has supplied moisture to allow FENGSHEN's strengthening in the past 24 hours. FENGSHEN is expected to weaken slightly as it passes through the islands in central/western Philippines. As it enters open water once again, it should intensify slightly, before weakening due to increasing vertical wind shear and lower water heat content near landfall. FENGSHEN accelerated and moved in a WNW direction in the past 24 hours. It has also developed an eye and has made its first landfall at the Philippines near noon today. 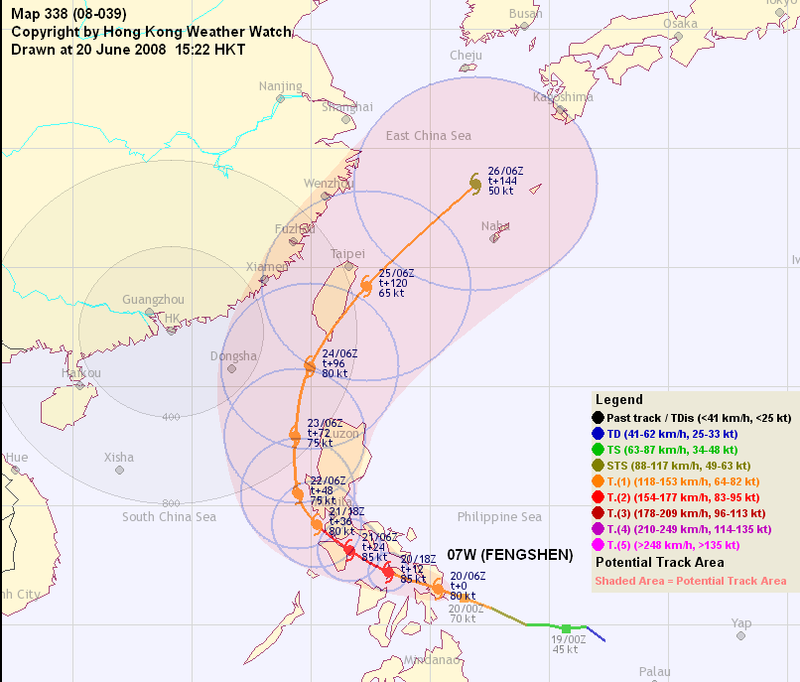 At 14 HKT, FENGSHEN was centred about 590 km (320 NM) SE of Manila. The ridge that is expected to weaken in fact did not weaken at the rate as expected. However from steering charts, it is seen that another subtropical ridge east of the ridge N of FENGSHEN has gradually extended westward at a rather low latitude in the past 24 hours. FENGSHEN is moving fast due WNW now and this trend is expected to continue in the next 12 to 24 hours. Afterwards, as the ridge N of FENGSHEN should weaken and the one E of it will continue to extend westward at a low latitude, FENGSHEN will be steered by this new ridge and is expected to go north near t+48. 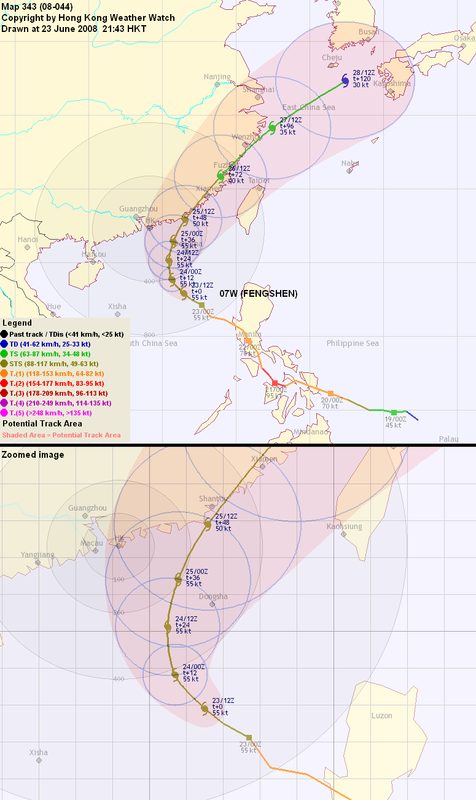 It is worth noticing that FENGSHEN's intensity during its passage across the Philippines will also affect its future track, and thus the uncertainty in the current forecast is quite high. FENGSHEN is expected to maintain strength (or even intensify a bit) as it passes through the islands in central Philippines. However, if FENGSHEN recurves earlier than expected, its structure may be severely damaged by the mountainous Luzon. 07W picked up convection last night and has intensified into a tropical storm, which was named FENGSHEN by the JMA. 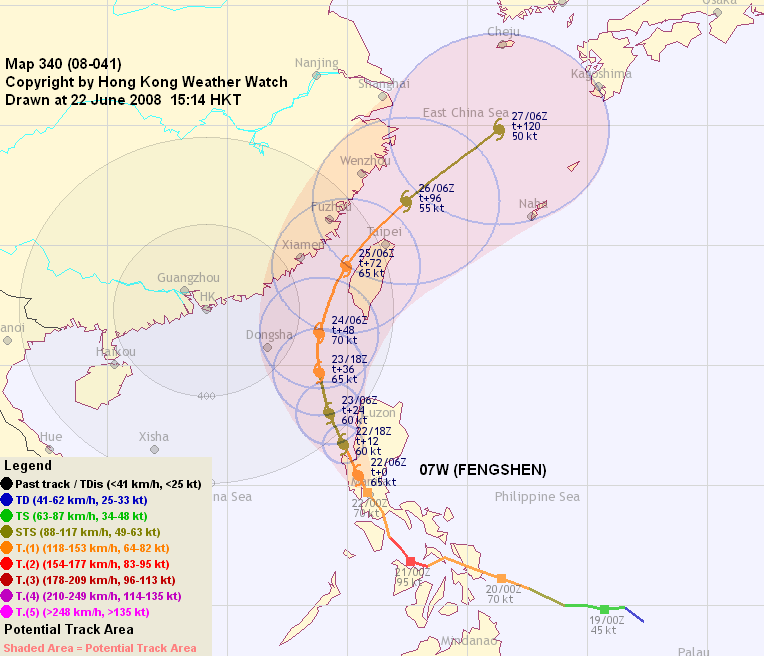 At 14 HKT, FENGSHEN was centred about 1100 km (600 NM) ESE of Manila. FENGSHEN intensified faster than expected and thus it is now being influenced by the steering subtropical ridge to a greater extent. FENGSHEN should maintain its W/WNW movement in the next 24 hours as it is still situated south of that ridge. However a mid-latitude trough will cause the ridge to retreat and a weakness will allow FENGSHEN to turn poleward gradually after t+36. FENGSHEN is expected to intensify at a pace faster than climatological rate as it will travel through a warm environment with little shear and good outflow channels. 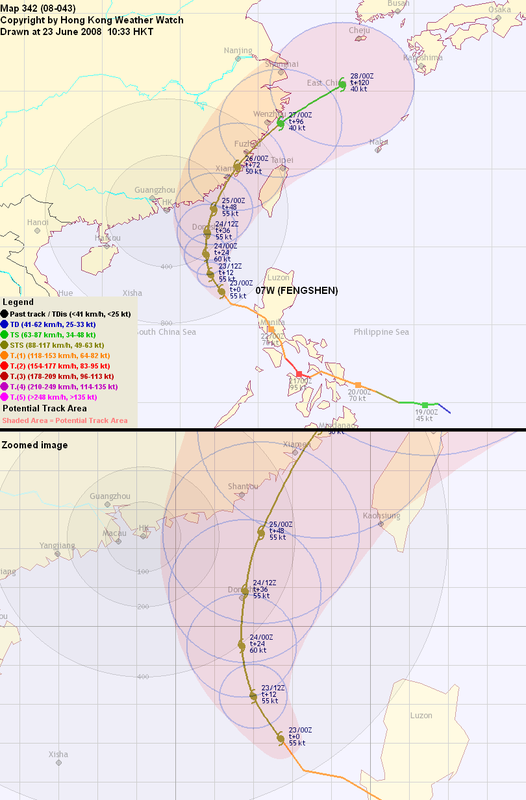 Its strength will depend greatly on how west it can travel before turning north, as this affects by how much it will be affected by land interactions with the Philippines. A disturbance east of the Philippines has intensified into a tropical depression today (07W). 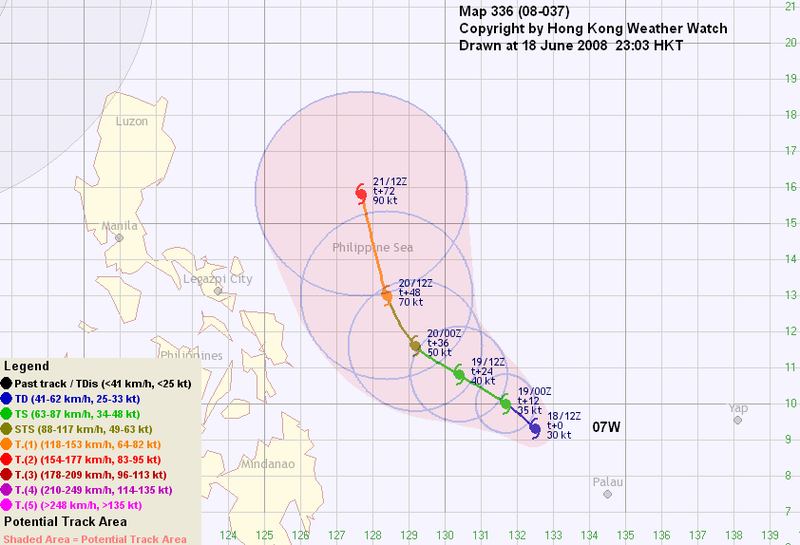 At 20 HKT, 07W was centred about 1370 km (740 NM) ESE of Manila. Subject to the subtropical ridge north of the system, 07W should maintain its WNW movement in the next 24 hours. However a mid-latitude trough will cause the ridge to retreat, thereby allowing 07W to turn poleward gradually after t+36. 07W is expected to intensify at a pace faster than climatological rate as it will travel through a warm environment with little shear.